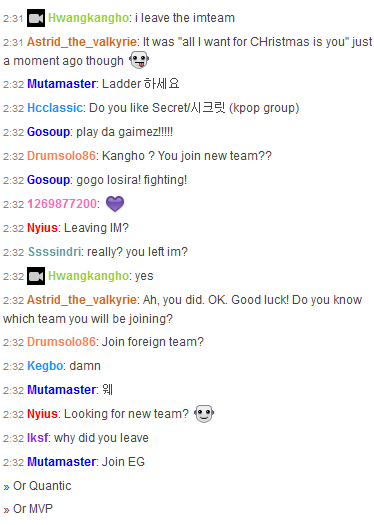 KangHo (formerly known as Losira) announced on his stream that he has left team Incredible Miracle after 3 years. It is not yet known if he is retiring or joining another team, and he has shared no further concrete information on the subject, though one might interpret the chat log below as him wanting to join a new team. IM will be participating in the upcoming season of Proleague, and most expected Losira to play a key role on the team's line-up. IM has so far made no acquisitions to replace Losira. WHAT THE HELL IS HAPPENING TODAY ??? SKT or EG please pick him up. lol. he has so much potential! Wow, yet another departure. And Losira/KangHo has been such a staple for IM. Wonder what team he'll get on next. I want to see KT or EG. EG has like 12 Zerg players... 12 of 'em being Jaedong. They don't need another Zerg ! Isnt it Cataclysm 3.0 by now?